ATTENTION: Most products are shipped within 48 hours of order. If you require a large volume of any product please contact enquiries@elexol.com for volume pricing and leadtime. Australian Customers: All prices displayed do not include GST. 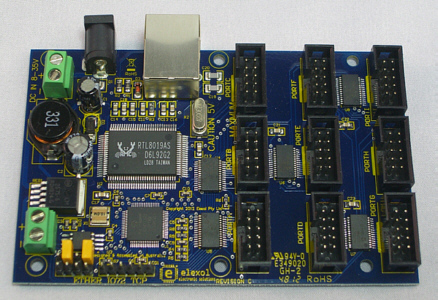 The Ether IO24 TCP is an integrated, micro-controller based network interface board with 24 digital user I/O lines and is the next generation of our Ether IO24 Range. The Ether IO24 TCP DIP is an integrated, micro-controller based network interface board with 24 digital user I/O lines and is the next generation of our Ether IO24 Range. 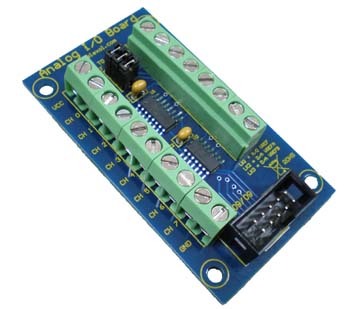 The Analog I/O Board is an accessory board that allows the implementation of an analog interface to Elexol’s existing I/O 24 Range. 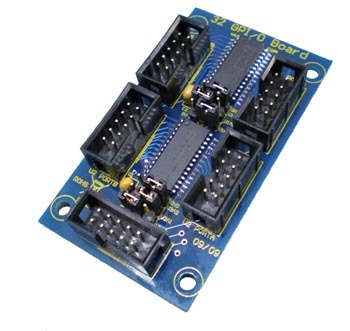 The Elexol I/O 24 Range consists of Ether I/O 24 R, Ether I/O 24 DIP R, USB I/O 24 R and the USB I/O 24 DIP R.
The GPI/O 32 Board is an accessory board that allows up to 32 I/O pins to be controlled through a single Port connection on Elexol’s I/O 24 Range. The Elexol I/O 24 Range consists of Ether I/O 24 R, Ether I/O 24 DIP R, USB I/O 24 R and the USB I/O 24 DIP R.